It started on Radio Free Asia’s morning political affairs program on June 6. A diplomat at the Vietnamese Embassy in Phnom Penh denied that Cambodia’s historical claim over today’s Southern Vietnam had extended up to colonial France’s departure in June 1949. “There is no basis for that, and no evidence—South Vietnam has belonged to Vietnam for a very long time,” said Tran Van Thong, the Vietnamese Embassy’s first counselor and spokesman, speaking in the Khmer language. The remark sparked protests at the embassy two days later, with nationalists and Cambodians from the southern Mekong Delta region of today’s Vietnam calling on Mr. Thong to either prove his claims or issue a retraction and apology. The racially charged protests sputtered along for two months until coming to a head this week with a public burning of Vietnam’s flag in front of the embassy, whose diplomats stubbornly refused to even take a petition from the protesters. “All of the Khmer Krom, the kings of Cambodia and the Cambodian government [have] never made an agreement, they never gave the land to Vietnam, and we always struggled to take Kampuchea Krom back until 1949,” Mr. Setha said Wednesday. Mr. Setha, the executive director of the Khmer Kampuchea Krom Community and a senior member of the opposition CNRP, said he recognized Vietnam’s present sovereignty over the territory but that its obfuscation of the transfer from Cambodian control was cruel. Sovereign under the Khmer court for centuries, escalating immigration of ethnic Vietnamese to the delta had, by the 17th century, sparked an unending battle over the territory as the Vietnamese capitalized on a divided Cambodia. “The arrival of the French, however, radically transformed the contest,” wrote Shawn McHale in his history of the dispute in the Journal of Asian Studies last year. The decision was criticized by the court of Cambodia, Mr. McHale noted, which argued that the Vietnamese leader had no right to cede sovereignty that was not theirs. Yet with the arrival of the French, who soon took Cambodia under their multinational Indochina colony, Mr. McHale wrote, conflicts over the territory ebbed. “Left unsettled until 1949 was the resolution of Cambodian sovereignty claims over parts of the lower Mekong Delta,” he wrote. Opposition leader Sam Rainsy said there is little dispute over who today controls the former Kampuchea Krom provinces, which includes Ho Chi Minh City—a city whose population of 8 million is more than half of Cambodia’s. But Mr. Rainsy said Mr. Thong’s comments had led to such emotional and often tense protests due to a collective national memory of Vietnamese abuse of Cambodia as the two nations struggled to assert their claims of sovereignty. “When you deny historical facts, you hurt a lot of people because a lot of people have suffered from political persecution by the Vietnamese,” Mr. Rainsy said. Official figures place the ethnic Khmer population in Vietnam at a bit more than 1 million today but activists claim a population almost 10 times the size exists. They also claim continued human rights abuses and policies of cultural assimilation, including the repression of Khmer language literacy. Since his remarks, Mr. Thong, who could not be reached for comment for this article, has steadfastly maintained that he has no reason to apologize and that Cambodian sovereignty had been lost to Vietnamese administrators long before the French arrived. Son Soubert, a former member of the Constitutional Council who comes from one of the country’s most prominent Khmer Krom families, said the issue of historical sovereignty over the delta is so vexed because of the mix of power in the area before colonialism. “There were no Asian states, it was kingdoms, and the territory changed from one to another upon whether you were successful in warfare or not. It was the Europeans who introduced legal administrative borders and so on,” he said. “Sometimes Cambodia was even invaded by the Vietnamese and controlled, and then there were outbursts of the population and they were forced back,” he continued. Council of Ministers spokesman Phay Siphan said the Cambodian government does not support the protests against the Vietnamese Embassy and suggested that both sides should study the disastrous history of provocations and recriminations between Cambodian and Vietnamese regimes during the 1960s and 1970s. 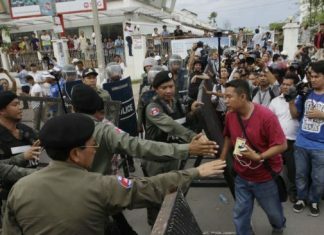 However, Kem Ley, a political analyst, said the protests were about more than a historical dispute. “There are also concerns about Cambodian land in the present time, with the land concessions going to Vietnamese companies, most of which belong to the Vietnamese government, while all the plantation workers are Vietnamese,” Mr. Ley said. Mr. Setha, the protest organizer, said concerns about more incursions are indeed central to his cause and that he doubted that Mr. Thong would come around to his version of history. “All along the border, they push into Cambodia, and so I don’t think he will apologize, because he wants to take the land from Cambodia more and more,” Mr. Setha said.